Designed according to IEC EN 61243-3:2014 to verify the absence of voltage – even with discharged batteries. 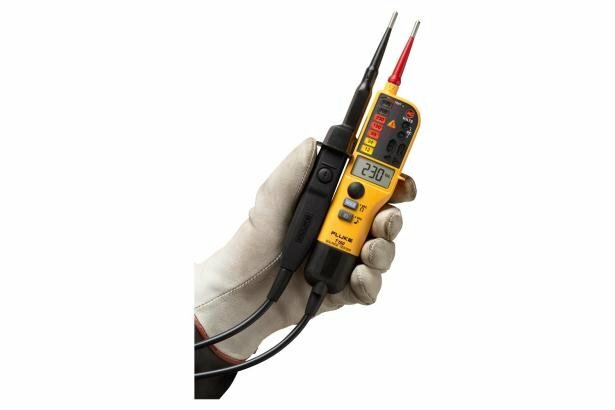 Fluke Two-pole Voltage and Continuity Testers give you fast test results the way you need them, with large, easy-to-use buttons, bright backlights, and clear audible and physical indicators designed for any work situation. Resistance measurements up to 1999 Ω. Display hold. Enhanced ergonomic design is easy to use (even with gloves on) and offers quick, secure probe docking. The Fluke T130 Voltage and Continuity Tester with large, easy-to-use buttons, a bright backlit LED indicator and LCD display, display hold, and clear audible and vibrating voltage indicators designed for any work situation. The Fluke T110 Voltage and Continuity Tester with electric torch, backlit LED indicator, clear audible and vibrating voltage indicator let you work with confidence, while getting test results the way you want them. The compact Fluke T90 Voltage and Continuity Tester gives you fast test results the way you need them in a slim design. Large, easy-to-use buttons, bright backlit LED indicators and clear audible indicator give quick results in any work situation. How do we test our new and improved Two-Pole Voltage and Continuity Testers? Two-pole voltage and continuity testers measure voltage, but just as important is when a two-pole tester tells you that there is NOT voltage present before working on any circuit. For you to rely on your two-pole tester, it has to be the most rugged and reliable tester you can find. That’s what Fluke’s redesigned two-pole testers give you. Fluke knows the cable assembly is often where failures occur. The cable on any Two-Pole voltage and continuity tester is its weakest point- it is repeatedly bent, twisted, wrapped and put under constant strain. If the cable were to break, it could place you at an increased safety risk. Industry standards call for the cable to be tested to withstand a forty-five-degree bend, and still work after 5000 bend cycles. Fluke puts our testers through three times what the standard demands, flexing the cable over 150 degrees in each direction. This is why we can offer you our strongest voltage and continuity testers warranty ever. Dual insulated cable tested to 3x the required bend angle provides increased reliability and durability. Improved probe docking for secure storage. Single-pole phase test offers fast identification of live conductors. Push-on probe tips, probe tip protector and storage accessory. The complete family of Fluke Two-Pole Voltage and Continuity testers lets you choose the features, functions, and price/performance to fit your applications and preferences.